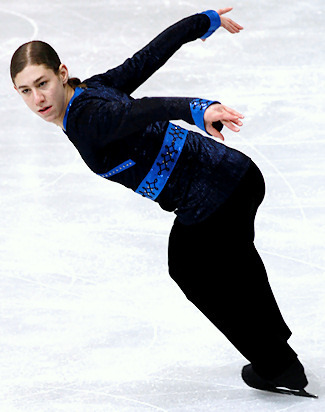 USA's Jason Brown performs to Nessun Dorma from Turandot at the 2011 World Junior Figure Skating Championships. When he was three years old, Brown’s older sister Jordan was invited to a skating birthday party in his native Highland Park, Ill. His mother, wanting to ensure that her daughter was comfortable with skating, took both Jordan and Brown skating. Brown continued to train, and started to make his mark in skating early on in his career. At the 2007 U.S. Junior Figure Skating Championships in Cleveland and just 11 years old, he captured the juvenile boys’ gold medal. He followed that up with a silver medal the following year on the intermediate level at junior nationals in Salt Lake City. At the 2009 U.S. Figure Skating Championships in Cleveland, Brown made his first appearance at “big nationals” competing as a novice man. He finished the short program in second place, and ended up winning the bronze medal in the competition. The following season Brown took the big jump up to the junior level and qualified for the 2010 U.S. Figure Skating Championships in Spokane, Wash. Though he finished in second place in both sections of the competition, Brown managed to win the title in one of the closest competitions at the U.S. Figure Skating Championships. In the fall, Brown was selected to compete on the Junior Grand Prix circuit for the first time, being assigned to skate in the event in Courchevel, France. Brown was next assigned to Karuizawa, Japan, for a second Junior Grand Prix event, but this time he was not as successful. On his way back to Chicago, Brown thought about what happened in Japan, and decided to use his sixth place finish as fuel for motivation. Brown headed home to prepare to compete at the 2011 Midwestern Sectionals in Ann Arbor, Mich., in order to qualify for the U.S. Figure Skating Championships in Greensboro, N.C. Competing at the senior level for the first time at sectionals, Brown easily won the competition, and qualified to compete at nationals once again. Brown’s ninth place finish was good enough to earn a spot to compete at the World Junior Figure Skating Championships in Gangneung, South Korea. “I found out that I was named to the Junior Worlds team about an hour and a half after the event ended. I was so excited to have another opportunity to represent my country one last time that year,” Brown explained. Brown finished the competition in seventh place, just a few points out of sixth, and established himself as a medal threat over the next couple of seasons. Brown has worked with 2011 Professional Skater’s Association’s (PSA) Developmental Coach of the Year Kori Ade for 11 years, and seems completely happy with the arrangement. Additionally, Brown works with U.S. Championships competitor Rohene Ward on choreography. The 2010 junior champ trains all over the Chicagoland area, getting ice time wherever he can get it. Lately, Brown has been putting in long hours at the rink, skating about four hours each day, and working off ice for several more. Brown has been working furiously over the summer to improve his skating, and has definite goals in mind on how to improve his standing. Brown made his season debut just this past week at Skate Milwaukee, and he also plans to compete at Glacier Falls in Anaheim, Calif., and the Dupage Open in Buffalo Grove, Ill., in August. Brown will skate to Bajofondo Tango Club’s Grand Guignol for the short program and Flow Like Water from the soundtrack of The Last Airbender for his free skate. He will compete once again on the Junior Grand Prix circuit, and is excited to see how things go. Brown is a full time student at Highland Park High School, where he will be a junior in the fall, which he admits to being a big challenge. Because he trains throughout Chicago, Brown has been fortunate enough to live at home with his parents Marla and Steve Brown, 18 year-old Jordan, and his 13 year-old brother Dylan. After his skating career is over, Brown hopes to work with children. And for the Brown fans, he still has his trademark ponytail, though he has been agonizing over it for some time now. Brown even enlisted the help of his coach recently, asking her to poll folks from the skating community about his hair. What do you think? Keep it or cut it?